During a contact lens exam, an optometrist will test your visual acuity, eye performance and eye health to determine what prescription is needed to correct refractive errors. After the contact lens exam, an optometrist will take cornea, pupil and iris measurements, as contact lenses aren’t a one-size-fits-all proposition. A keratometer is used to measure the cornea. This instrument helps an optometrist choose the right curve and size for your contact lenses. Additional computerized measurements may be taken with a corneal topographer. The corneal topographer measure how light reflects off of your eyes and provides precise details of the entire cornea. An eye doctor uses a biomicroscope to evaluate the eye’s surface. It’s a slit lamp that provides a magnified view of the front of the eyes. Automated instruments that measure the pupil size and iris are also used. All of these procedures are completed to provide you with contact lenses that fit comfortably and provide good vision. Several visits may be needed for a contact lens fitting. The prescription written for contact lenses will outline the contact lens power, base curve and diameter. Today, there are a variety of types of contact lenses. Rigid gas-permeable (RGP) contact lenses are made of flexible plastics that allow for the flow of oxygen through the eyes. Daily-wear soft lenses are also made of soft, flexible plastic and are available in tints and bifocals. 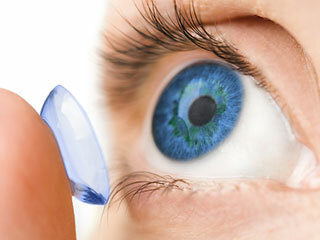 Extended-wear contact lenses can be worn overnight. Extended-wear disposable contact lenses are soft, can be worn for an extended period of time and then thrown away. Planned replacement contact lenses are replaced on a schedule, from two weeks to quarterly. There are many reasons to consider contact lenses. There’s no frames to obstruct vision, they don’t fog up and generally offer better sight than eyeglasses. Plus, many folks feel they just look better in contact lenses. Wichita Optometry is located in Wichita, KS, and has a team of experienced optometrists who offer corrective contact lens evaluations, fittings and prescription management. Our optometrists work closely with patients to determine the best type of contact lens to choose. They are also experienced in tough-to-fit contact lenses. Patients undergo a variety of measurement tests for refractive errors and precise measurements of the ocular structures. If you’re considering contact lenses, give us a call at (316) 942-7496 to schedule a one-on-one consultation. Great eye care begins at Wichita Optometry.